Late in his career, architect Frank Lloyd Wright designed one of the world’s most famous houses. In 1934, Pittsburgh retail magnate Edgar Kaufmann hired Wright to build a house near the waterfalls of Bear Run, Pennsylvania. This book traces Wright’s steps through planning, construction, and successful completion of the unusual house nestled in a hillside. The illustrations echo the Japanese print style that inspired Wright’s design in spreads paced to underscore the tranquil setting. 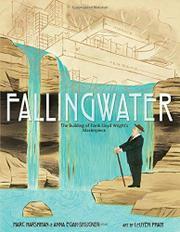 One vertical double-page spread emphasizes the height of the house jutting over the waterfalls. The book’s effectiveness, however, is marred by inconsistencies in text and illustration that seem to be a result of an attempt to appeal to both younger and older children. Languid prose alternates with short, choppy sentences throughout. For instance, the narrative recounts Wright’s dreams in stately free verse: “In dreaming this house he will use everything / he has ever seen: stone walls from Wisconsin, / sand and adobe from the Southwest, / towers and trellises from Italy.” His client’s desire for speed comes in jarringly clipped sentences: “Mr. Kaufmann calls. He is in Wisconsin. / He is coming to visit. / He wants to see the plans. / He will arrive in two hours. / He is coming to see his new house!” This, coupled with the flat, cartoonish depiction of some characters (mostly though not exclusively white), detracts from an otherwise pleasant book.